BoA Kwon (권보아) was recently seen at Incheon International Airport, heading to Shanghai for SM Town Live '10 Concert along with other SM Entertainment artists. This isn't the first time we seen her travelling in style, but this time she looks cooler and more stylish! The singer wore Balmain jacket with a denim jeans, brown bag, boots and Karen Walker sunglasses. The Balmain Cotton Canvas Military Jacket retailed for approx USD$4560.00 on Net-A-Porter, no longer available. The Karen Walker Deep Freeze Sunglasses retails for AUD$295.00 on maximillia.com. Also seen on one of my favorite style-bloggers, Karla of Karla's Closet. 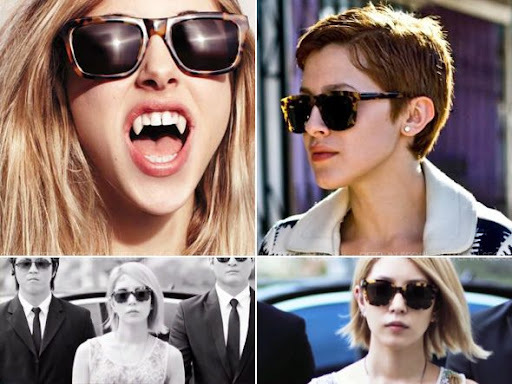 BoA also wore the same sunglasses in, Game music video. Singer Beyoncé Knowles as well as WAG, Alex Curran have also wore the same jacket previously. Beyoncé Knowles wore the jacket with Balmain denim and Brian Atwood pumps. While Alex Curran wore the jacket with a cut-out tee, leggings and boots. Definitely giving it to BoA, she carries the jacket well and it's perfectly styled. Many thanks to Chubee for sharing airport candids!